Updates from topics covered in previous posts. On a couple of occasions we’ve looked at scientific studies linking birth issues with a mother’s proximity to fracking wells. On January 5, we looked at a study that examined Pennsylvania birth records from 2004 to 2011 to assess the health of infants born within a 2.5-kilometer radius of natural-gas fracking sites. They found that proximity to fracking wells increased the likelihood of low birth weight by more than half, from about 5.6 percent to more than 9 percent. The chances of a low Apgar score, a summary measure of the health of newborn children, roughly doubled, to more than 5 percent. Today we have another study that looks at the connection between how close the mother is to natural gas drilling and birth outcomes in a study of 124,842 births in rural Colorado between 1996 and 2009. The study shows an association between density and proximity of natural gas wells within a 10-mile radius of maternal residence and an increase of as much as 30% in the prevalence of congenital heart defects. Thanks to the Montana Cowgirl Blog, Montana’s #1 political blog, for putting us on her blogroll! Click to check her out. The oil and gas industry challenges all these studies, but let’s face it — that’s their style. If it doesn’t fit the “fracking is completely safe” narrative, they attack the messenger. These are credible scientific studies that either have been or will be reviewed by other scientists. The long-term impacts of human exposure to increased drilling in populated areas are the “unknown unknowns” that Professor Joe Ryan talked about on January 30. Are we going to roll the dice on public health, or are we going to wait until the technology is safer and the health effects are known before we allow drilling to expand? The oil and gas in the shale isn’t going anywhere. You can read a PDF version (471 KB) of the new study, and examine supplemental material (143 KB). On January 21 we examined the dramatic increase in oil spills due to railway accidents and the vulnerability of Columbus to train disasters in the event of increased drilling along the Beartooths. 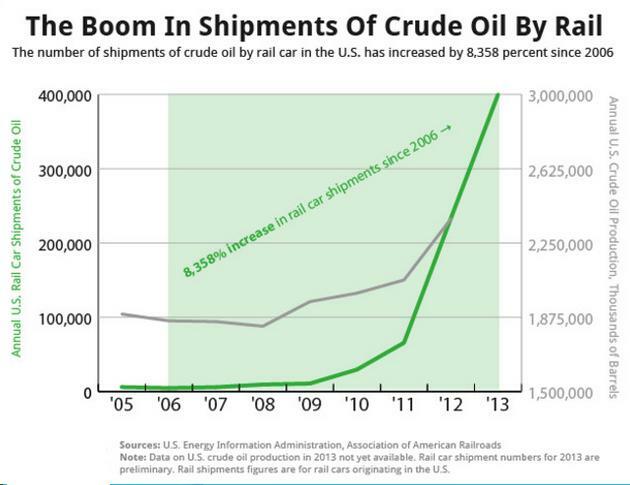 Today there’s some new data on shipments of oil by train that demonstrate our risk is increasing dramatically. Shipments of crude oil by rail have exploded by more than 8,300 percent since 2006, effectively creating a new industry where one didn’t previously exist. As a result, regulators are now scrambling to figure out what to do about it. As the chart indicates (click to enlarge), the United States is producing increasing quantities of crude oil and rail is the only viable shipping alternative. The gray line on the chart represents crude oil production in the United States; the green line shows rail car shipments of oil produced in the US. There’s no help on the horizon, and as long as oil production continues to increase we’re going to see more accidents, more spillage and more danger in our community. Last, here’s a link to a three part video series by WITV in Buffalo, New York, where rail safety is a substantial concern. Buffalo is a major railroad center, and much of the Bakken oil headed east goes through there. The report centers on the risks of leaks and explosions in a major metropolitan area. It highlights the DOT-111 tank car, which is part of an aging fleet with safety issues. If you watch the first video, the other two load in sequence. And really really last, between the time I wrote this and posted it, a train from the Bakken spilled 12,000 gallons of oil between Winona and Red Wing, Minnesota. No major cleanup is planned. Aside | This entry was posted in Fracking Information and tagged Beartooth Front, birth weight, fracking and neonatal health, fracking risks, Montana fracking, railway safety. Bookmark the permalink.